Last week the pair continued to lose positions and finally reached the lows of February. Euro is still under pressure from ambiguous European statistics. Despite the fact that German GDP for Q1 was at the high level, the same index for Eurozone was below the forecast and the pair EUR/USD fell the level of 1.3647. However, later, the data on the US consumer price index helped the pair to go back to the level of 1.3700. Last Friday the pair was in the narrow range of 1.3690-1.3725, due to lack of important macro-economic news. The minutes of the meeting of the US fed will be released this week. It is assumed that the regulator will leave asset purchase program unchanged and will not raise interest rates. At the same time, European Central Bank may revise its monetary policy. The nearest support level is 1.3700, which will be followed by the levels of 1.3680 and 1.3660. The level of 1.3700 is the key one for both, the “bulls” and the “bears”. Resistance levels are 1.3725, 1.3745 and 13785. 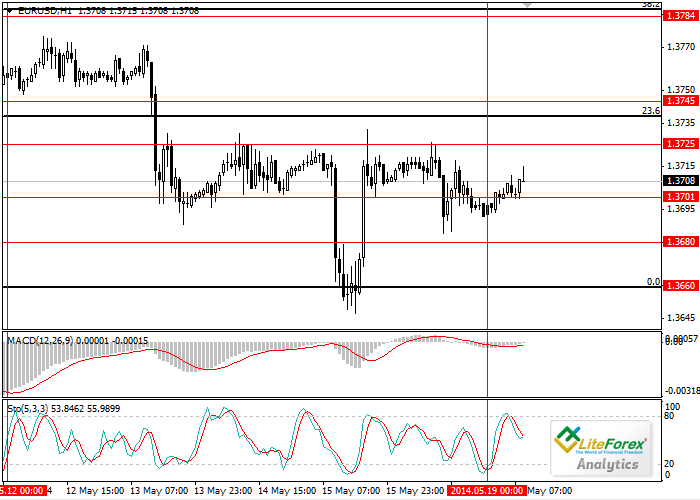 It is recommended to sell after breakdown of the level of 1.3680 and consolidation below this level. Long positions are advisable above the level of 1.3745.